Hrishikesh Mukherjee is often referred to as one of the forgotten film directors of Indian cinema. Admittedly, much of his work has been overlooked for reasons largely to do with an indistinct directorial style and the middle class sensibilities of his protagonists. The fact that Hrishikesh Mukherjee was a Bengali film maker and not an Indian one seems to provide one of the clearest explanations for his rejection of becoming accepted and positioned in the context of mainstream cinema. Though he did work with many of the A list film stars, his unpretentious approach to film making was nurtured by his formative years as an editor and assistant director with the talented neo realist director, Bimal Roy. This early experience with realism and the ideological imperative of socialism did leave an influence on Hrishikesh Mukherjee but he chose rather to focus on middle class stories and popular genres. Today, his name is often associated with that of Amitabh Bachchan. Amitabh Bachchan did some of his best work with Hrishikesh Mukherjee but they also seemed to exhaust the creative possibilities of their cinematic relationship very quickly whilst Bachchan’s superstar status started to cloud his artistic judgements. In the midst of his more popular films like ‘Anand’ and ‘Chupke Chupke’, Hrishikesh Mukherjee directed a number of understated melodramas beginning with ‘Anuradha’ at the start of his career in 1960. Coming at the end of the 60s, it would be safe to position this film alongside the work of Bimal Roy, Raj Kapoor and Guru Dutt. 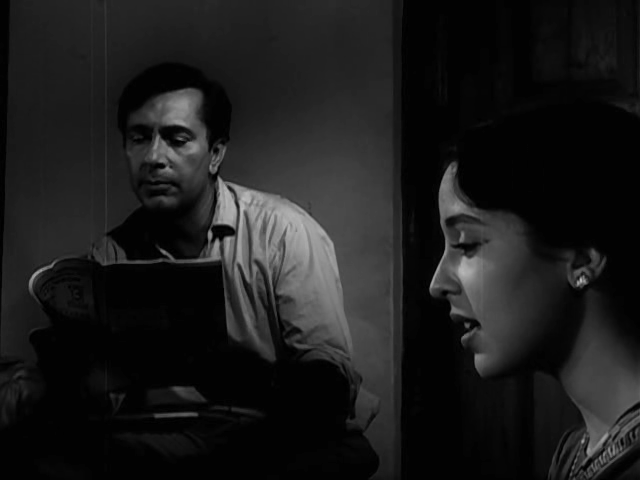 In the film, Balraj Sahni, whom Hrishikesh Mukherjee had worked with on ‘Do Bigha Zamin’, plays an aspiring doctor, helping the dispossessed and poor in a rural village. He is joined by his wife, Anuradha Roy (Leela Naidu) who is forced to make a painful sacrifice by choosing to surrender her artistic ambitions as a talented radio artist so that she can support her husband’s idealistic desires. Structured through a series of flashbacks and recollected by the memories of a lonely Anuradha, the film shows a sympathetic concern for feminine anxieties and aspirations. Though the character of Dr. Nirmal acts as the most visible link to neo realism, it is the character of Anuradha who becomes the focus of the narrative, representing a familiar brand of stoic femininity immortalised in such films as Mehboob Khan’s ‘Mother India’. Unlike the patriarchal values of Hollywood cinema, Indian film makers working under the studio system regularly sought to uncover a heroic struggle within matriarchal ideology. The mother figure continues to act as a symbol of Indian nationhood; silent, hardworking and traditionally dutiful yet prepared to sacrifice absolutely everything to survive. However, the melodrama genre has always accommodated the voice of women more strongly than that of traditionally male dominated genres and therefore it is of little wonder that Mukherjee explores with great humanism and intelligence, the high price a woman must pay so that Indian society could continue to progress in an era when rapid educational and medical programmes were slowly being implemented by the secularism of a Nehruite government. Compared to his contemporaries, Hrishikesh Mukherjee’s popularity as a film maker seemed to peak with that of Amitabh yet his films dealt with middle class concerns that predate the parallel movement that would emerge in the early 1980s. The films Amitabh Bachchan made with Hrishikesh Mukherjee were the antithesis of the overblown multi starer of the 70s. I think this is where his true strength lay; he never allowed any of his actors to overshadow the material with their star presence. Stardom was an aspect of film making that he criticised and this perhaps explains why he was so successful in extracting some of the best work from the biggest Indian film stars. Unlike today, the film makers who forged auteur careers under the studio system like Hrishikesh Mukherjee were masters at being able to subtly integrate song and dance sequences into the overall narrative, without shifting focus away from the important social message. At the end, Anuradha’s endless sacrifices for her husband’s medical career and inherent desire to help the impoverished transforms from something personal into a microcosm of Indian motherhood and female resilience that often goes unacknowledged. This entry was posted on October 17, 2014 by Omar Ahmed in Indian CInema and tagged Auteur Cinema, Balraj Sahni, Indian Cinema, Melodrama.